The team at Hyperkin have made quite a few retro related products over the past few years, but it sounds like it might be considering moving more into the handheld market – and an interesting new post hints at what kind of future it could be going for. 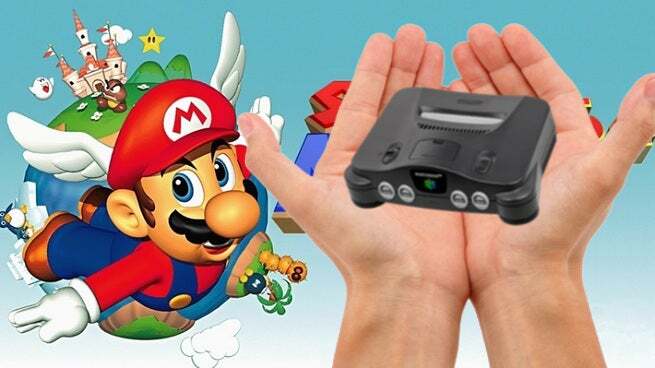 A Hyperkin senior account manager who goes by Ramon Navos-Moral recently took to Facebook to showcase a new prototype making the rounds at Hyperkin – a portable Nintendo 64 system that features a screen built into the controller. 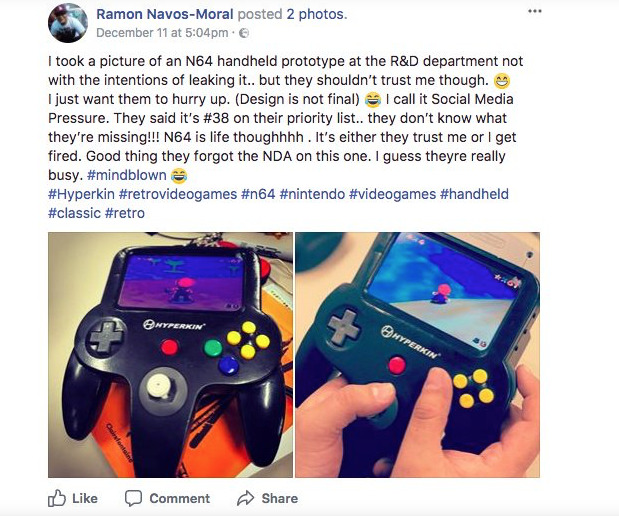 “I took a picture of an N64 handheld prototype at the R&D department not with the intentions of leaking it…but they shouldn’t trust me, though,” he noted. “I just want them to hurry up. (Design is not final.) I call it Social Media Pressure. They said it’s #38 on their priority list…they don’t know what they’re missing!!! N64 is life thoughhhh. It’s either they trust me or I get fired. Good thing they forgot the NDA on this one. I guess theyre really busy. #MindBlown” The post has since been taken down, but we screen-capped it below. While the unit does look legitimate, we can’t help but question if it actually exists. First off, Ramon’s post, while excited, doesn’t really seem like something coming from an account manager. Also, why would he risk getting fired over leaking a prototype that’s on a list with several others? And then there’s his wording. Hyperkin noticed as well, and, according to Nintendo Life, action has been taken against him for distributing internal R&D projects online. It did confirm that this is a work in progress, but there’s no given timetable on when – or even if – it will enter production. Still, it’d make for a novel product, especially for gamers that want to take their N64 gaming on the go without lugging around a system and mobile monitor. We’ll keep you informed if the product ever does become officially announced. But you’d think there would be a better way to reveal them, instead of going, “Here’s a neat little N64 handheld system lulz.” Hyperkin may want to keep an eye on this guy in the future – and maybe keep him out of the design lab for a while.